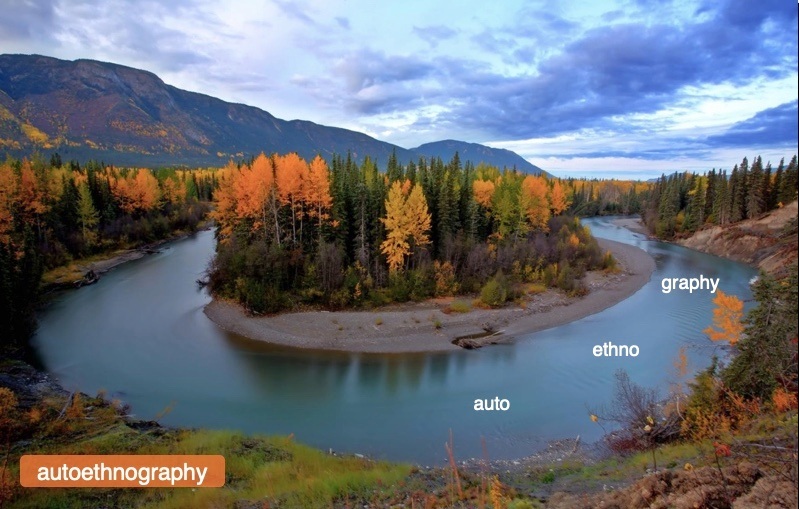 From research presentation - Endako River, central BC. In mid-2015, I was accepted into and began a Doctor of Education (EdD) at Athabasca University, an institution that offers only online courses, training and degrees. The institution is based in Alberta, and partially in north-central Alberta on the border of Treaty 8 and Treaty 6 Territory in the community of Athabasca. The EdD program is offered entirely online, with the exception of a 1-week Orientation session. Students in the program are expected to focus research (and resultant dissertation) within the broad field of online learning. I am now nearing completion of my fourth year in the program. I have completed five doctoral level courses focussed on the field and practice of online learning - nearing completion of the sixth and final course, which is more a support group than a ‘course’. Along with confirming a final and third committee member, I hope to defend my dissertation proposal in the coming month to two. At that point, I become a doctoral candidate with only research, dissertation writing, and dissertation defence ahead. Over the last 3 years, and through each doctoral course - I have focussed my research and course work on my planned dissertation research. The goal has been to build research and writing skills in the area I intended to focus my research for, and subsequent writing of my dissertation. This has included building my database of reviewed literature, theoretical underpinnings, and honing my thought process(es). In summary, very close to the time that I was accepted into the EdD program - the Truth & Reconciliation Commission (TRC) on Indian Residential Schools in Canada was wrapping up its work. In the summer of 2015, the TRC published interim final reports. The Final Reports and 94 Calls to Action were released late in 2015 - the entire package weighing almost 30 pounds. It’s an impressive (and stark) body of work, testimony, and reflection gathered over some 7 years. Right around the same time, and in somewhat quieter fashion, another document-agreement was signed in British Columbia (BC). The Declaration of Cultural Safety and Cultural Humility in BC Healthcare services was signed by the CEOs of all Health Authorities in BC, the newly-formed First Nations Health Authority, and the BC Ministry of Health. This was followed up in March 2017, with all 23 BC health regulators (e.g. College of Nursing Professionals, College of Social Workers, College of Pharmacists, etc.) also signing on to the Declaration. My current (and past) work circulates through these ‘events’ - through the political, legal, cultural, social, economic pressures, events, and histories that precipitated these events and resulting documents - and, now, actions and planning to respond and implement guidance provided within or through. Concurrently, my doctoral research is also mired within these. In recent months, I have delivered multiple presentations related to my ongoing research. My research also intersects and interfaces with my professional work. This work is multifaceted as I work within healthcare, as well as instruct part-time at two post-secondary institutions. I also do bits and pieces of contract work as time or opportunity allows. Through coming posts, I intend to explore, share, and ponder my current research along with ongoing work and personal reflection. This is also the methods and methodology I have engaged in for my doctoral research. For those not familiar, it is related to autobiography; however, differs in that it is also embedded within, or guided by, practices of ethnography - e.g. the study of culture or cultures. Therefore, autoethnography is often referred to by its three component parts: auto (the self) + ethno (culture(s)) + graphy (the writing). As such, an autoethnographic study can take many forms (inc. a blog…), but essentially becomes a critical self-reflective exploration of oneself within a culture or cultures. In this particular case - e.g. 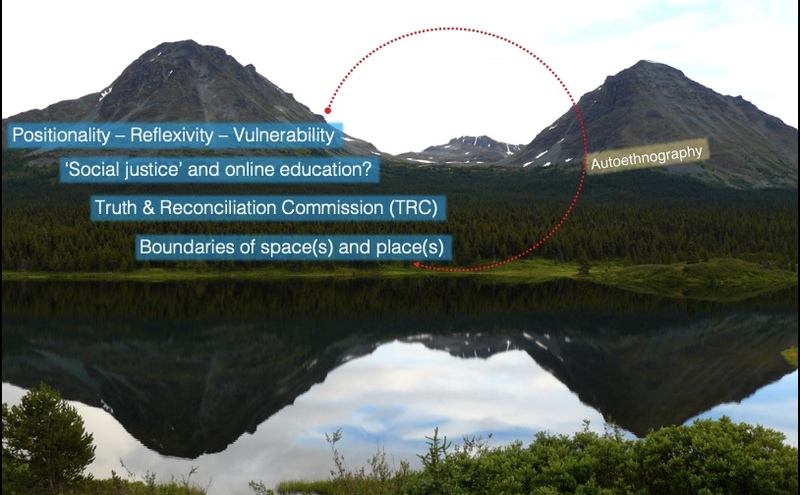 my doctoral research - I intend to critically self reflect on my experiences of online education (as a student, instructor and curriculum designer), with the TRC and the Declaration serving as a context in which to explore and reflect upon those experiences. Below is an image of one of my presentation slides which provides an outline of my current research. two mountains on the divide between the Ingenika River (Mackenzie R. drainage) and Sustut River (Skeena R. drainage).